We set off for our usual Christmas walk with friends and family on a fresh but beautiful sunny day. Our Christmas walks have not always such an enjoyable day out as this one, taking us through Brockwell Park and on to Dulwich before heading for West Norwood. But it is easy to catch a bus too. 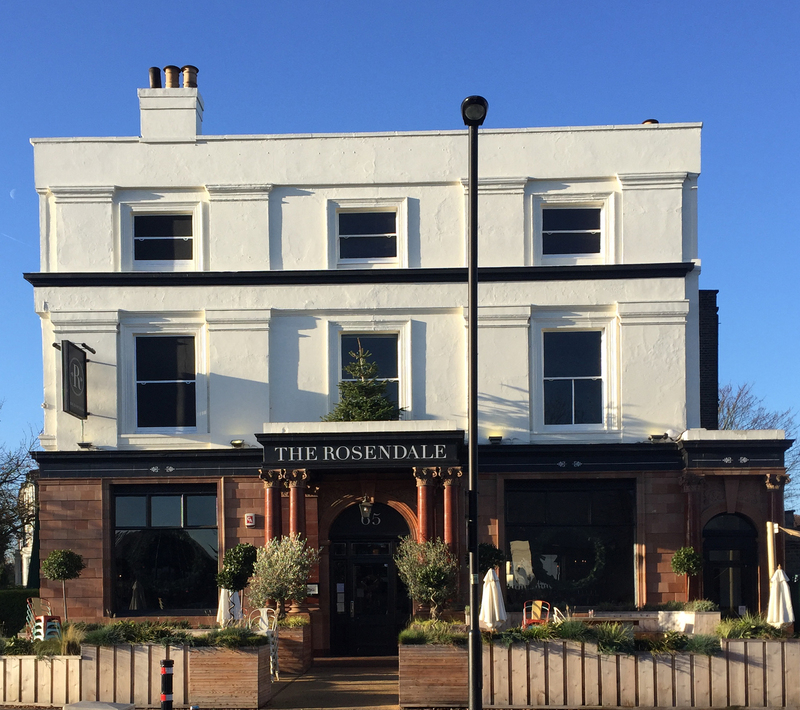 This is a large and imposing Victorian pub set on the corner of Rosendale Road and Park Hall Road in what it’s friends might call West Dulwich. We had reserved a table for nine of us at 2.30 and almost on the dot we sat down with menus, glasses of wine and beer and disrobed in the warm atmosphere of a full family pub/restaurant. Lots of other family parties with children everywhere, pushchairs maneuvered and, it has to be said, pretty noisy. However, most of those with younger children had chosen to eat early and as the afternoon progressed (we were there for nearly three hours) it became less frenetic. The service was good through-out. 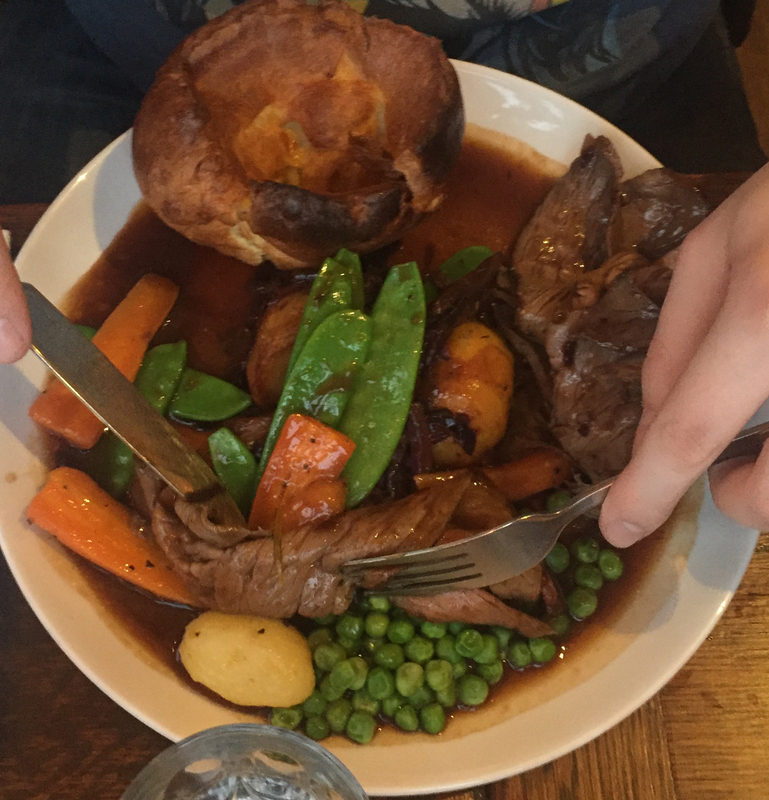 This pub has meat and plenty of it, especially on a Sunday. But I am getting ahead of myself as this is three courses from what might be styled a gastro-pub menu. 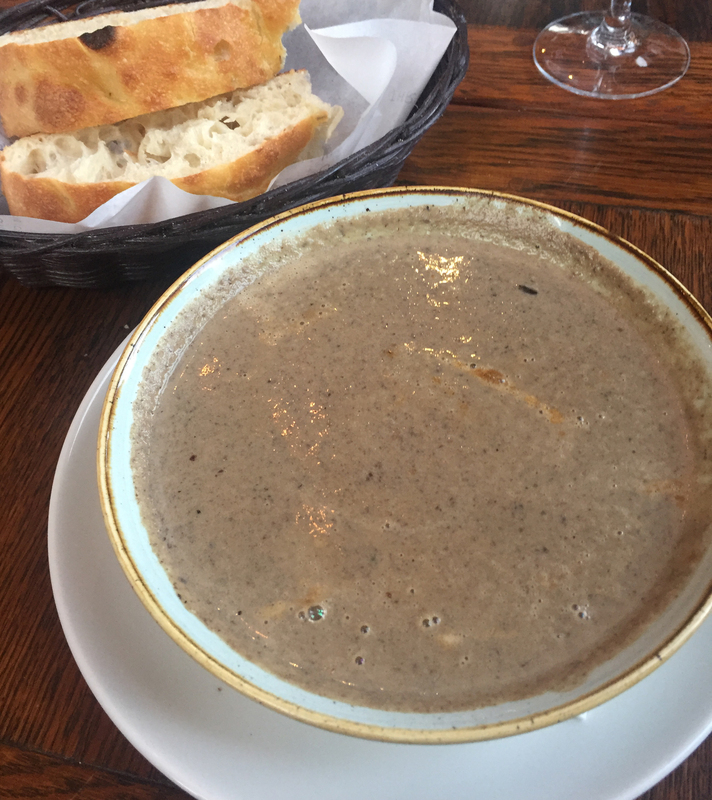 There were too many of us to list everything that was ordered but starters worth mentioning were the Cauliflower, cheese and onion tart; partridge and wild mushroom terrine; salt & pepper calamari; and mushroom & chestnut soup. So plenty for the discerning vegetarian. 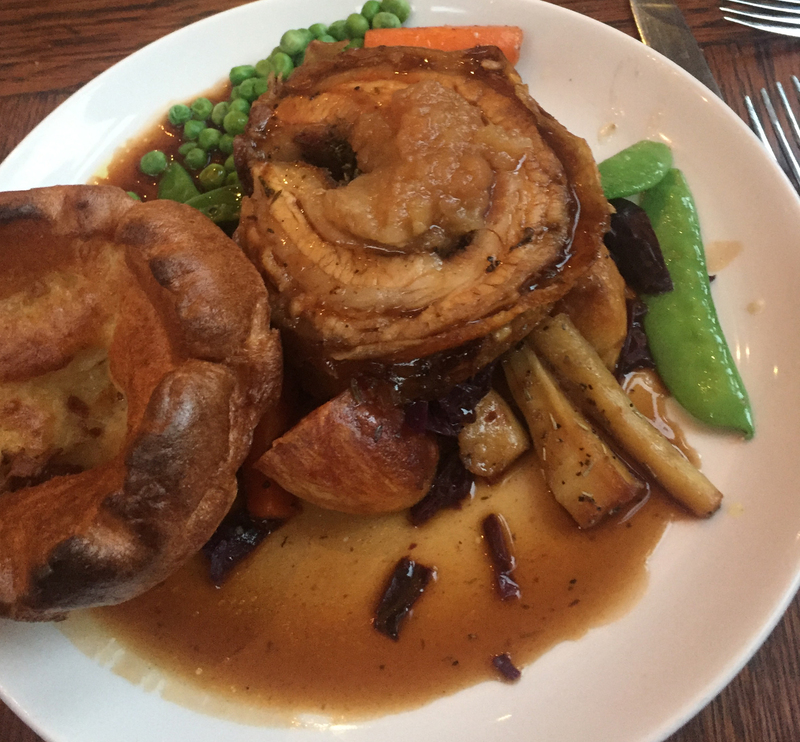 For Mains, there is the obvious choice of a roast with a choice of beef, pork, turkey or nut-roast, all of which came with Yorkshire pudding and gravy. For those with a particular penchant for the Yorkshire, you can order an extra one with extra gravy. We chose the beef and the pork, and others chose hake and chips, trout fillet, Spinach gnocchi and steak. We all had slightly different wants and sometimes a definite need – like slim chips not hand cut ones. They managed all of our little idiosyncrasies. 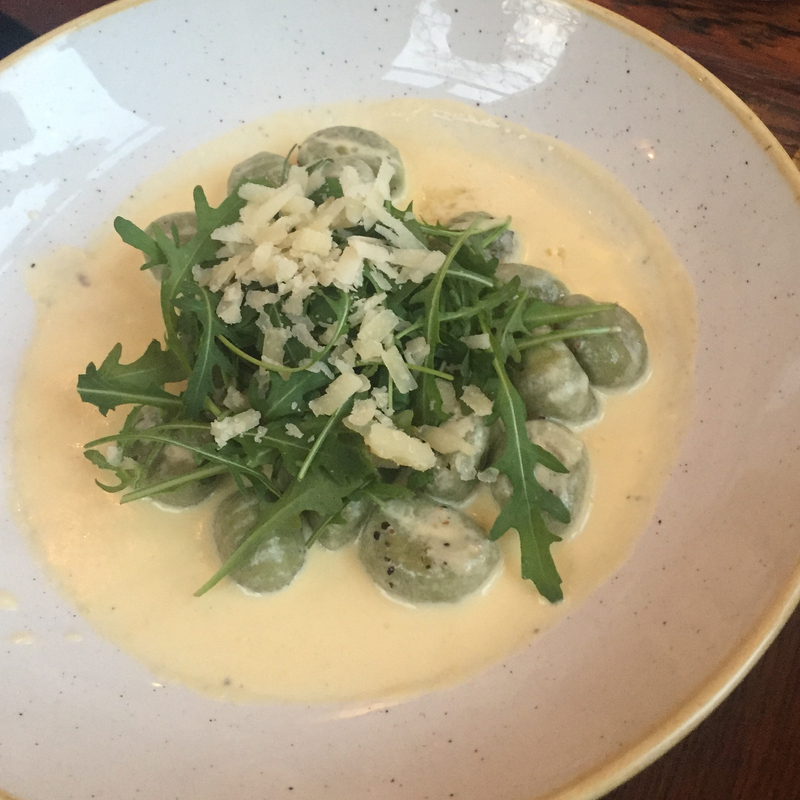 We cannot fault any of the dishes and portions were ample. 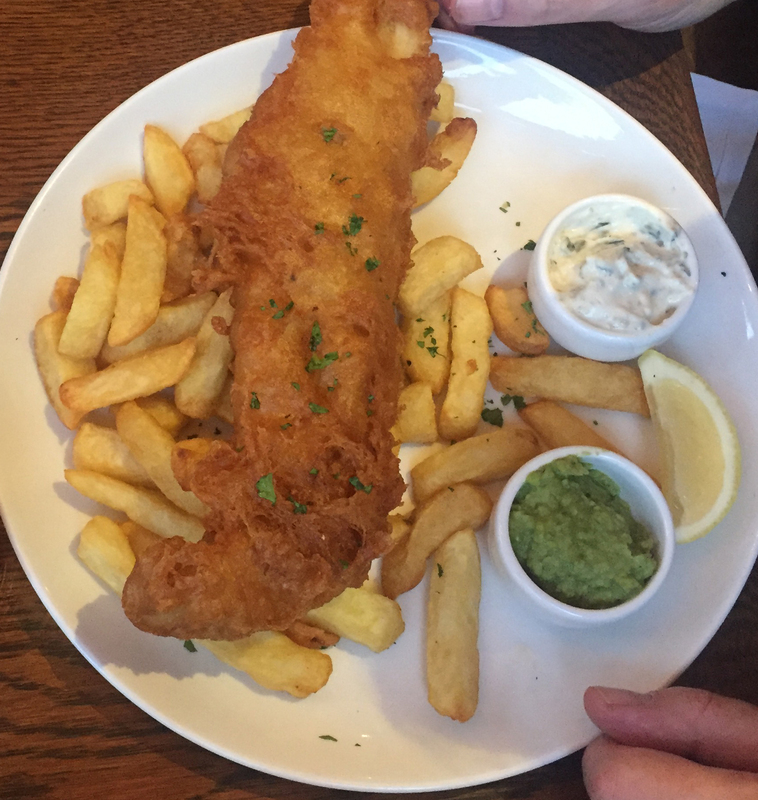 To comment on just my own choices – the trout was spectacular. 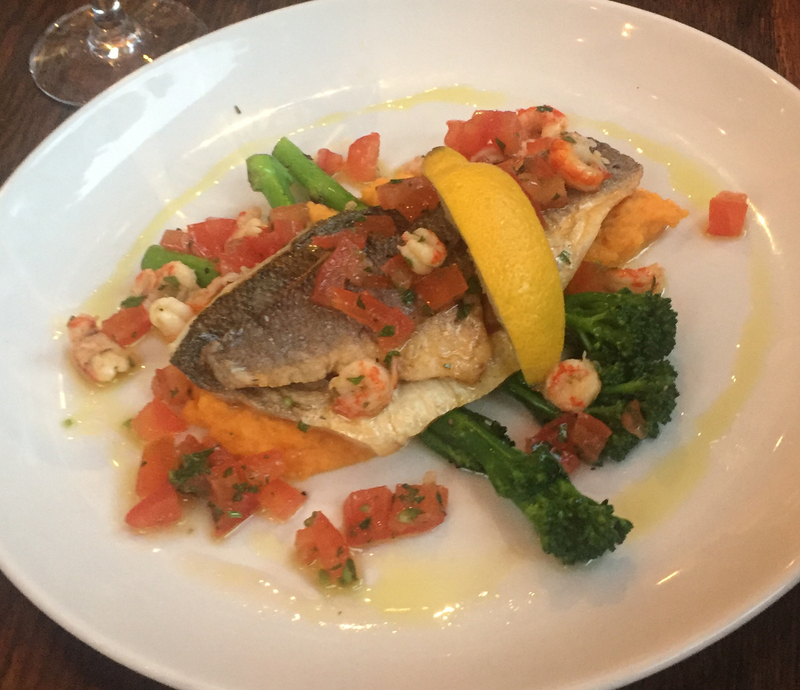 It was cooked to perfection and served with a pan haggerty, broccoli, crayfish & a tomato vinaigrette which added a lovely freshness. This was served after my cauliflower tart (which could have had a little more cauliflower but the pastry was great). 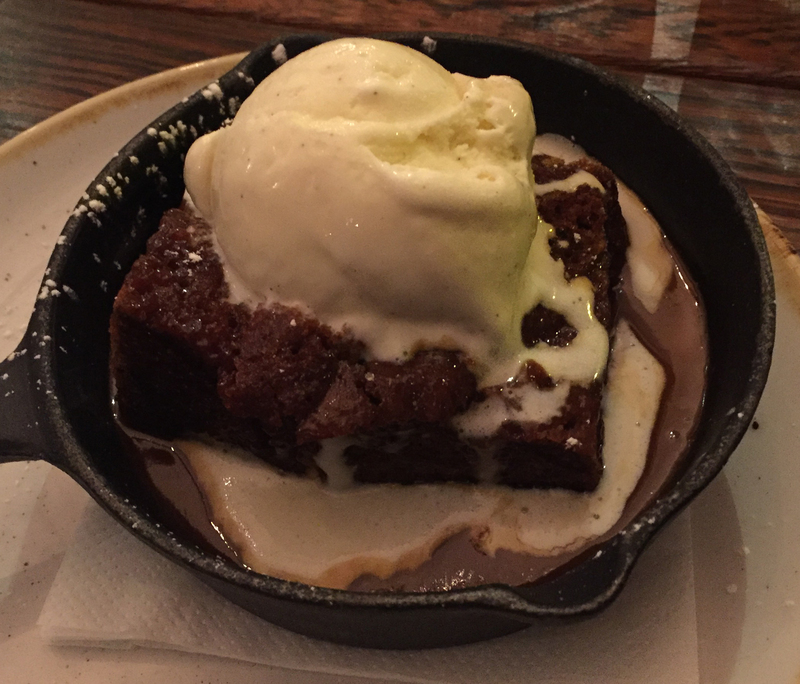 For those who are wondering what pan haggerty is, its a sort of potato and onion cake from the North East of England..
For dessert there are a lot of hefty looking options and those of us with enough stamina went for flourless chocolate cake and sticky toffee pudding. Both of which lined our stomachs for the bus ride home. 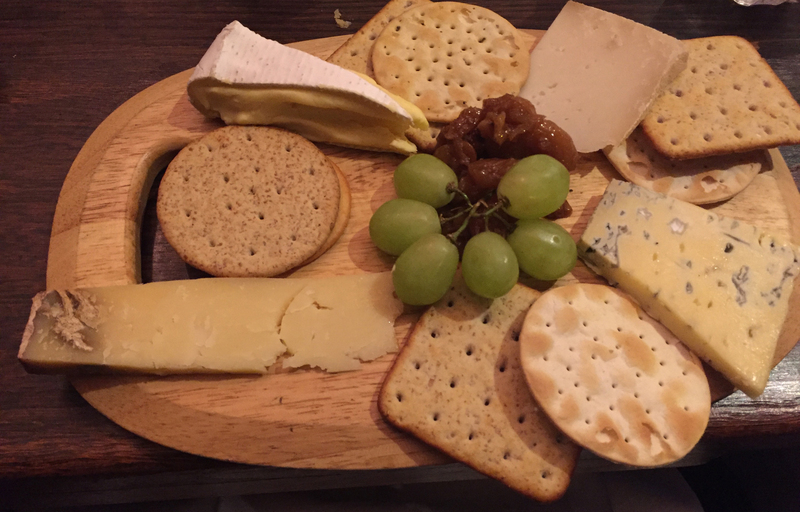 We washed this down with several bottles of fizzy Picpoul, some glasses of red wine, real ale, at least one cosmopolitan and tap water. 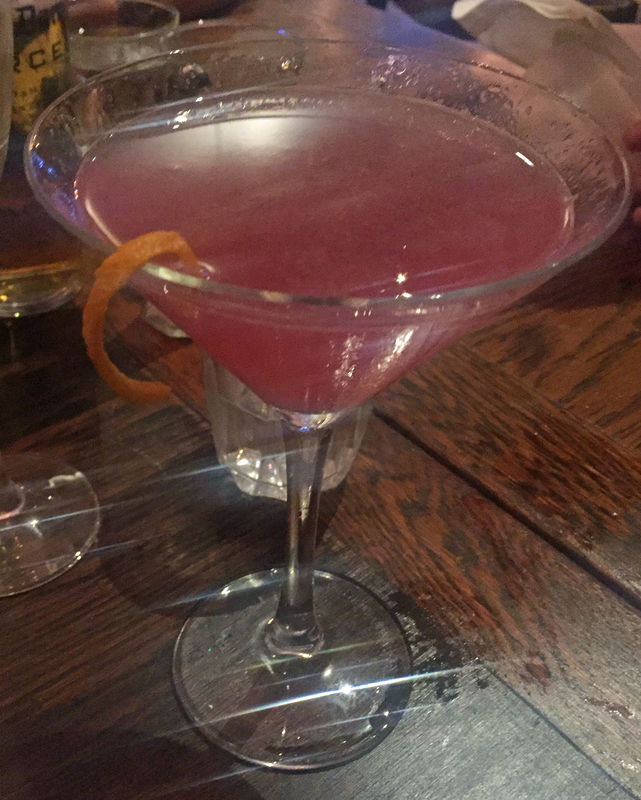 The whole bill was about £45 per person. 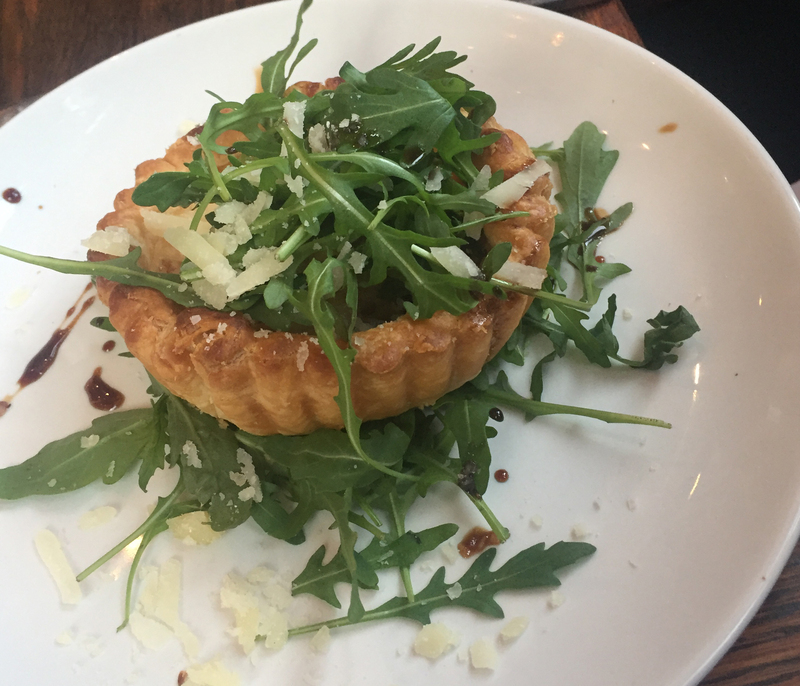 Our final verdict – this place might lie somewhere between a Harvester and a up-market gastropub, we would definitely return, simply because it was fun.